A year ago, this middle-aged lawyer decided to go back to school. Not to get more education for myself, but to serve the students at my local public high school. If you read my post: A Personal Investment in Public Education, you know the story. I was looking for a way to make a real contribution to America's future when my local paper posted an application for a seat on the local charter high school's board of directors. In my application, I wrote about my belief that every American should participate in improving public education, regardless of whether we have children in the system, because we all benefit from an educated citizenry. In fact, an educated public is the foundation of our democracy, culture, civil society, and economy. Our taxes support public education, but not fully. In my state of California, long heralded nationally for the best public education in the nation, facilities and computer systems lag behind those at private institutions, classes are overcrowded, there is a freeze on new textbooks, teachers are laid off, salaries are cut or frozen, and about half of California students are dropping out before graduating from high school. Those who make it face increased tuition at our public universities where great professors are hard to keep at reduced salaries (while local billionaires give billions to local private universities that reach fewer students -- and not the students who struggled to make it to college.) I wrote my last post on this subject just after I began my 2-year volunteer term at the high school down the street. The past year has been a real education for me. I knew when I signed up for the board position there was a lot of work to be done, and I could make a real difference. But my first year has been more fulfilling than I could ever have imagined, and I want to share some highlights with the hope that I might encourage you to go to your local public school and find out how you can help. 1. Those anonymous teenagers who come from over 100 zip codes are starting to look familiar, and they smile back at me. 2. I have the opportunity to improve my own town by improving the facilities at the school. For the 50th anniversary of the school, volunteers gave it a complete makeover with fresh paint and landscaping. We have a brand new pool, financed in part by a gift from a wonderful teacher who has been at the school all of its 50 years. There is a lot more to be done, like getting modern computers and a performance art center that could benefit the entire community, and I am happy to help seek the funders who can make this dream a reality. 3. I have the opportunity to help bring back illustrious alums to inspire the current students. Recently, WILL.I.AM visited the school unannounced to check out his old locker. He stayed for an impromptu visit with the students who are still abuzz with the connection to greatness. Most public schools have successful alums who can bring so much back to their alma mater. 4. I get to work with the dedicated founders of The Village Nation who with zero money but lots of heart, have developed a program to infuse confidence in African American students with mentoring and wonderful programming that has brought increased grades, test scores and happiness to students all around Los Angeles. Check out these videos, especially of the founders on Oprah. 5. I had the privilege of getting to know the dedicated teachers and administrators whom I now consider friends. Our first meetings were tough and we had marathon sessions that went into the early morning hours, but we established trust, hired a new principal, and the school is on the path toward greatness. 6. I really appreciate what my tax dollars mean everyday to the young people who will inherit our nation. 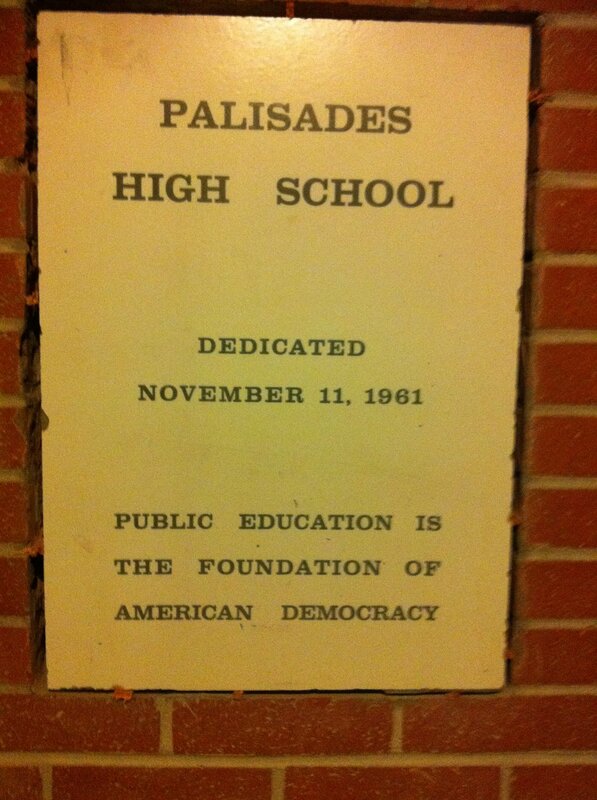 I admit I had a tear in my eye when I first saw the dedication plaque for the school that reads "Public Education is the Foundation of American Democracy." So true. 7. I'm up on all the latest trends in clothes and music. 8. I get to help fight crime in my neighborhood by serving on the MySafeSchool anonymous tip line. 9. I know some of the football players, so the games are much more interesting. 10. I get to see the future in every student's face. To learn more about my local public high school, Palisades Charter High, and the innovative programs that have earned it recognition in Newsweek magazine as among the top 1% of public schools in the nation, see the school website. I encourage you to invest in your local public schools with your time, attention and donations. You will get more back than you give, I assure you.